A chocolate-brown broadleaf wrapper from Connecticut covers choice aged tobaccos from Honduras. The result is a cigar whose name translates to “king of the world,” and rightfully so! Packaged in a pack of five cigars. I look forward to each ERDM I smoke and JR's price can't be beat! Packed tight, but not too tight for a great draw. Flavor and strength consistent with a shot of pepper and spice up front followed by a maduro flavor of molasses, some chocolate and leather, yet a little short on sweetness. The first thing about this cigar is the great look of the wrapper.the preflight smell is very good.once lit is very long lasting and quite enjoyable. At this price, this is the best cigar I have smoked. I've been smoking them for years, and keep coming back. 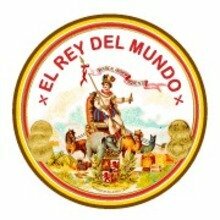 I love El Rey del Mundo cigars. I had just seen a terrible review on YouTube where the cigar was burning very imperfectly. My own experience with ERDM (in a wide variety of sizes in EMS and maduro) has been quite the opposite. Lots of excellent cigars with near perfect construction and consistency over a very long period of time. I'm stickin up for these sticks. A yard gar or dog walker, but that certainly doesn't mean anything bad. These are delicious. I prefer the smaller ring size vs the big fatties. These seem to pack a little more punch. A great deal on a cigar that tastes like a cigar oughtta taste. These are nice inexpensive cigars. Many moons ago They were a true go to smoke. I have to admit they are consistently better than the budget junk that's out there. They slipped badly for a long time but they are getting better. If you need to save money don't go with the 1dollar and 2 dollar junk. Go for these. I recommend the torpedo as it requires a better roller to make them which translates to fewer burn and draw problems. The flavor profile is very good for the money. Not a lot of flavor !!! But I've had worse. Very smooth and great tasting cigar. One of my favorite smokes. Anothe ERDM hit with me. Actually got these by mistake instead of the Rectangulare that I ordered, I notified customer service and in less than three days even with the holiday I got my Rectangulares and was allowed to keep these fine cigars too. The flavor is very much like the Rectangulares. A little tighter draw on these but the Rectangulares have one of the easiest draws I have ever had. Nice cedar and a bit of cream and leather with a touch of spice more pronounced towards the end. Medium to medium strong in nature. 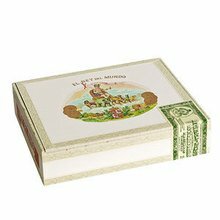 I have to say for the money the El Ray Del Mundo cigars have impressed me very much, equal to pricier sticks with fancy new names and marketing. Best smoke for the money. I have never had a bad stick. Always keep some in my humidor. One of my all time favorite cigars. Remarkably consistent and flawlessly constructed, this cigar is mellow and strong at the same time. 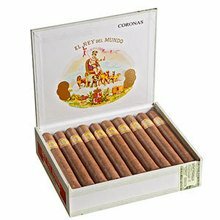 El Reys are my go-to value stick; full flavored, spicy and always satisfying, and the Choix vitola is as good as it gets! Great smoke. A tiny bit harsh at the end, but, I smoke them down to a nub, so that is suspected. Ordered these on sale & really liked them. This cigar is now my favorite 6x50. Choice Quality. A well made cigar with a great flavor. It easily competes with cigars costing many times more. My initial 5pk was a dried out bad batch. Rcvd my replacement to the 50th state within 10 wrkng days which was concerning. However, I was pleased with the quality of this auction purchase. Nicely constructed with a good burn and draw. Spicey flavors detected on the retro.